I thought I would clarify that my husband is not a big loser! ha! It is just the title of my post today. He cracked up when he saw that title over his picture! Click the button and join us on Wednesday's Walk. Share a memory or special story with us and add the button to your post and link up with Mr. Linky. 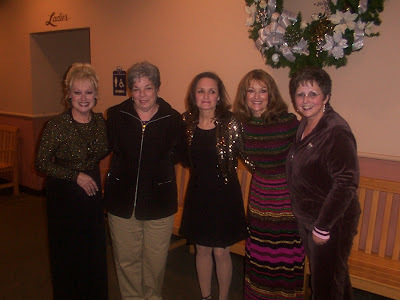 This is a picture of my friend Toni and I when we met the Lennon Sisters in Branson Mo. This has nothing to do with my post, but I came across it and thought I would add it. On this same trip we stopped at Lamberts~ The House of Throwed Rolls! Have you ever been there? 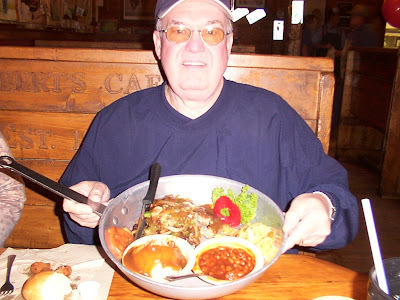 My husband's skillet dinner picture (above) just shows how much food they serve you,...and they throw you more rolls whenever you want more. They also walk around with second helpings of Okra and Fried Potatoes and all kinds of fattening stuff. This is definitely no place for a dieter! Last night the "Biggest Loser" show was on. I don't watch this show,...but I have seen parts of it now and then. I think it is amazing how hard they push these over- weight people, and how they teach them to be disciplined in their lives. The results are amazing! I have been slim before. When I married my husband John,...(33 years ago) I weighed 121 pounds. Then little by little throughout the years I gained weight. Boy,...did I gain weight. I am now heavier than I have ever been in my life!!!! And I am so unhappy about it. Just a couple of years ago I lost 60 pounds by being more active, walking, and eating sensibly. I had also cut back on salt intake, and was drinking more water. I had cut out pop, and chocolate too. I felt more disciplined and more "in control" of my life. It felt good to see some of the weight falling off. I gave some of my bigger clothes away. I had to buy some smaller sizes and I loved it! Well, you may be asking "what happened to cause you to lose that discipline? ", well let me tell you my story. LIFE HAPPENED! Life, and death, and illness, and other stresses. Now as I look back and think on all the things that happened in the past two years I can see what happened to my self discipline,....it flew out the window! I didn't realize while it was happening, because it was a gradual process, but one thing after another altered my routines, and my new good habits went by the wayside. We moved into a new home that we had built, and although it was fun, it was stressful at times. There were a lot of decisions to be made, and always things to think about. (Just purchasing custom blinds for the windows this last Oct. has taken over 6 months to get them installed properly as they kept having issues,...and they still aren't all installed). It seemed nothing could just be a simple process. Life is like that sometimes. But with stressful times food is often a comfort,...even when you don't realize you are turning to it. I also woke up one day with a slipped disk and pinched nerve in my neck and for several months I was in constant pain, and the exercise dvd I used to do was now not an option. I couldn't reach over my head without horrible pain, and I couldn't even move my neck without turning my whole body in the direction that I needed to look. Reaching, bending, showering and washing my hair were very painful. I only found relief for short periods of time when I stayed in certain positions. I became very sedentary. I sat and I ate and I slept,...and I gained weight. I got to feeling sorry for myself and I couldn't seem to come out of it. John would bring me ice cream and snacks as I sat in my chair and it seemed that only those treats seemed to lift my spirits. I had some pain pills but they made me sick to my stomach so I couldn't take them. I had several trips to the doctor and then they sent me to a pain specialist who did an epidural in my neck. A few weeks went by and there wasn't much change in the pain level, but then just before the second epidural I started getting better. And little by little my pain was gone. From time to time it comes back if I move wrong or sleep wrong or work over my head, so I have to be careful. Ever since then I haven't resumed my walking routines and exercises. The fear of getting that disk moved into that same position where it is pinching the nerve again, just keeps me from doing a lot of things I used to do. When it is pinched it makes my right arm numb right down to the finger tips, and since I am right handed it is hard to do things. Well back to the order of my story. My mother-in-law's cancer returned and that, along with her other health issues made it necessary for my husband and I to travel back and forth to Nebraska to help with her care. We were there for days, and sometimes weeks at a time. So, my eating, and exercising patterns were altered. It was hard to see her in a helpless condition because she had always been so self sufficient. Once in awhile I would go for a walk if my husband was there to sit with her, but it wasn't like the vigorous walks I had done routinely at home. I would cook for her and fix her goodies and then I would sit with her for long periods of time and just visit with her and watch tv. When we weren't with her, we would dread each phone call, thinking that it was going to be the family telling us she was gone. As it turned out we were there in Nebraska when she did pass away, but we had been made to leave her bedside to take a few minute break and run into town, and during that 5 or 10 minutes she passed while we were gone. This broke my heart because I wanted to be there with her. But God had other plans. Her daughter Becky was with her, and I think mom would have liked that she was the only one there, because they were very close. After mom died we were back and forth to Nebraska several more times to clean up her house and sort through stuff and there again it was a long, sad process. Which isn't over yet. We still haven't gotten her house sold. John is the oldest in the family and a lot of the estate settling fell to him, and this has been hard for him. We both have been missing mom so much and trying to work through everything. My sister in Oregon needed a lung transplant and was trying to get on the list. She was in and out of the hospital over a dozen times in a one year period. Kansas is a long ways from Oregon and I couldn't just jump in a car and go and see her when I wanted to. And she was always on my mind. I felt bad that I couldn't be more encouraging and available to her. I felt helpless when she would be in the hospital for weeks at a time, and I kept telling my husband that we needed to plan a trip out there because she might not make it through one of these hospital visits. So we did go last fall and I am so glad I did because she died on January 16th. We flew to Oregon for her service and I spoke and shared several of the special things about my sister Judy. She was the oldest one left in my family, so now I am the oldest. It makes me feel very strange to think that I am now in that position. And there is only my younger brother after me. Where does life go? It seems like not that long ago we were the little tykes in the family, playing together and not having a care in the world. But we all grow up and face trials,...all of us. And speaking of that my good friend's husband passed away and I am always trying to be available to her. We often go out to eat, or go for treats when we get together. When you love someone you share their burdens. You cry with them and grieve with them,...as well as try to be there for them and encourage them. It has been hard to see her go through tough stages, and the ups and downs of grieving. My heart has ached for her many times. And it makes me think about the possibility that we never know when our spouse might get sick or pass away. It forces me to admit that it could happen to me too someday without notice. It seems we can never prepare for the loss of someone we love so much. Just about 4 years ago we lost our 6 yr. old granddaughter Anna. It was so very hard to accept the fact that she was gone. Everytime we were at our daughter's house we felt like she could just come downstairs or from another room at any time. It just didn't feel right for her not to be there with her family. It took so long for it to actually sink into my head and heart, that she was gone. We miss her so much. Then after Anna we had to help care for John's dad and 3 years ago in Feb. we lost him. Then we lost our friend that May, And a year and a half ago in September we lost John's sister. Then a year ago Feb. we lost mom. Then 3 months ago we lost my sister. So, you can see we have had many losses and stresses in our lives and situations that altered the routines of our lives. It is hard to get back into our routines. We still feel our losses at times. But this story has a brighter side. We do have hope in our Lord and Savior, Jesus Christ. He has helped us during each of these situations. He has been there with us when we felt like giving up. He has been there when we cried out in pain. He is still healing our broken hearts. He is there in our devotion times. He hears our prayers that we pray for our friends and family members and our church family. He answers them and gives us hope and comfort. He does encourage us in many ways,... through friends, and family, and church members. And He does amazing things, and always provides for our needs. I may sound like I am "the biggest loser", as I re-counted all of these losses of our loved ones, but I know that I am not. I know that there are lots of people worse off than I am. I know that I should count my blessings for all that I do have. I know that I have so much to be thankful for, and so much to look forward to in this life. I have a wonderful husband and beautiful daughters that I love so much. And I have 11 terrific grandkids. I have 3 more of them in heaven,...and the good news is I will see them again some day. And yes, heaven is where I am going when I die, and that's where my husband will go when he passes,...and that brings me assurance of God's love. I trust in His promise of eternal life. Now, even though I have gained weight I am still not simply going to accept it and stay here if I can help it. By God's grace John and I are going to start on a healty diet plan soon and hopefully we will shed some pounds and gain some more energy. We have some fun plans for this summer and maybe by then we will be feeling healthier and more able to be more active. Say a prayer for us if you would and,...maybe I will be "The Biggest Loser" after all! (Concerning weight that is!) But on second thought I know John will start dropping it faster than me, because that always happens. Even when he cheats! You are an amazing woman! What I absolutely love about you and what makes you someone that I completely look up to is that no one would ever know that you have suffered so much heartache in your lifetime. Your love for the Lord no matter what life deals you and your enthusiasm for life because of Him is amazing. I admire you so much! Thanks Kristin, I love you too! You are one of the bright spots in my life. God gave me a special gift when you came into my life. I had no sooner posted this and you had already posted a comment! God is so wonderful! Amen? I love this post from your heart. There are so many losses, struggles, and stresses in this life. And, I have battled eating healthy and taking care of my body often during times of loss and stress in my own life. I felt better when I did take care of my body...and need to get back to being more disciplined. My husband always loses the weight faster too...even when he cheats! That made me laugh. I love how Jesus shines through everything you share. You have such a beautiful heart Linda...and I treasure our visits. P.S. I'm glad you go to the golf course and encourage your husband. It is a beautiful way to enjoy the outdoors. And a great way to show love to your husband! Oh...and I will be praying for you in this area. Let's pray for each other!!! That is a whole lotta food in that skillet thingy! Wow! It's more like a buffet!! Hey, I watched the Biggest Loser last night. It's so great to see people changing their lives and getting healthier. Now that is a reality show worth keeping. My mom was the same way as you. She and my dad made a lifestyle change for the sake of their cholesterol and my mom ended up losing a good amount of weight and she was very happy about it. You could see it in her face. But things happened and they went back to the old ways of eating and living and the weight came back. Now she is motivated to get back to the better lifestyle and stick with it. I hope she does it. It makes her feel better about herself and it truly is better for her body. It's so nice to see God so intertwined in your life. It's inspiring! Oh, BTW, the game hillbilly golf is the one with the golf balls on a rope. It could be a 2 player or 4 player game. I like it with 4. You set the stands so far apart and 2 players are at each end and then you throw the golf balls at the other end and try to wrap them around the stand. The top bar is 3 pts, middle is 2 pts, and bottomm is 1 pt. Opponents pts cancel out your pts on the stand. So if I put my ball on 3 pts and the other person got theirs on 1 pt I would only score 2 pts. You can try and knock each others balls off too and they lose their pts. You go to 21 and if you go over 21 you get bumped back down to 13 and have to work your way back up. It's a very fun game!! You do have to pay attention b/c you don't want to get hit by one of them. I've had a few close calls and I've almost hit other people. I've always wanted to go to Lamberts--but guess we live too close? I've heard the food is great. Hi Mom. I know you've had a lot on your plate (you know what I mean) these last few years. Stress affects our bodies so much. I know that some of my weird health related things are from grieving so deeply. Grief is so hard - I could physically feel it affecting my body. I know that you and Dad will turn things around because once you set your mind to something you don't falter (I got that from you). The kids and I were just saying how disciplined you are with food already (regarding your allergies and such) - if you can be that careful with that, you can do anything. I love you my sweet momma. It was SO MUCH FUN chatting with you last night (way too late). Are we good at what we were doing or what. I'm still laughing at us. (I do think we are right though). Have a beautiful day Mother Nature (for old time sake). Blessings to you this fine day. Said a prayer for you and your husband. I am heavier than I like and I know that this weight thing can certainly be a thing of unrest. God comfort you and give us all strength to carry on. Thank you sweet ladies for your prayers and encouragement. I appreciate the sympathy and the encouragement. You are a special granddaughter! We had fun with you and we were glad you could come and stay with us for a couple of days. What a powerful testimony to God's grace...admist all the pain and heartache - He gives us the courage - the hope - to rejoice and praise His name! What a beautiful post....all the glory to Him! I would love to hear more about your healthy eating plan..I am all about that these days. I so want to keep my lymphoma in remission..but I also want to honor the Lord with my body, my lifestyle and food choices - and I want to stop obsessing over food...etc. etc. Hope you will share your thoughts. Thank you for sharing your heart like this. I understand how the stresses of life can make your diet plans vanish. I've been trying to lose the same twenty pounds for years. But it seems like every day is filled with situations like your shades. Nothing seems to be simple to deal with any more. But I am thankful God can bring me back to peaceful thoughts when I turn my focus on Him. But I do need to work on the self-control issue too. The problem is most of the time I just don't want to push myself to be disciplined. I need to work on my "want to." Just wanted to stop by and say thanks for the compliments on my business! Have a great day today!! I will be praying. I deal with stress with food myself. It doesn't help that the stuff tastes SO good. And Lamberts...yummy! When we travel & see a sign for it I get all excited...although it's been years since I've been to one. You are a very couragious woman and have an AMAZING family! Linda, you are such a special lady. Every time I read your posts to your daughter and granddaughter I just love you more. You are such an encouragement and blessing to those around you. I just love the Biggest Loser - it's my favorite program. I'll plan the whole week around that show. I was doing the Challenge Diet until Ryan's accident, but now my priorities have changed and I'll have to table that for now. It was a great help when I could do it. You've been through a lot, but I can tell you have come through it with such grace and still loving the Lord.